This fan is pretty quiet and moves a lot of air.I had this fan included im my hundred eleven from antec. I started hearing strange motor sounds only a years after i buyed it.Disapointed ny short time lapse it lasted but well, might only be unlucky. Great fan for the price considering it moves a lot of air and its quiet. Its great when used as a case fan or heat sink fan. Great fans, very silent, comes with cable extension and silence adapter. Makes almost no noise and is great for radiators. It looks a bit off, and I had a bit of trouble mounting it to the top of my Haf x. Not only that, but it had no screws with it, and I had none from the case, so I had to go find some.other than that, nice fan. Pros: Well made.Quiet.Move a ton of air!3 speed switch is a nice touch. This is a very nice fan for any custom cooling job or if you have a case than can fit it. I have 3 of them on my rigs external rad am really pleased with the performance. They are dead silent on the low and medium settings and still move alot of air. Even the high setting is quite liveable unless your a silence freak. I can't detect any unusual motor noises and none of them have died on me so I'll give them 5 stars! Pros: - Moves a high volume of air.- 3 speeds.- Quiet. I bought one of these to mount as a side panel fan on my NZXT Vulcan, it works perfectly and is still very quiet on the medium setting, as a note even on loud it's not whiny at all. However, and I'm not certain whether this is a rule for 200mm fans or not, but it's longer in one dimension than the other so if your mounting point is a perfect square there *may* be issues. Cons: Fins can break easy when spinning fast.I broke a fin "Stupidly" while cleaning it with an air compressor attachment.I would like a higher RPM model. A nice variable speed side/top/front fan for modders.I got 2 of these for a custom case i made from wood & aluminum.I have placed each on both sides of my case to help cool the back of my motherboard & add airflow for my video cards.Personally i see these fans primarily as "mod" fans for the side of the case to help add air to video cards & or memory.I replaced the front 3 fans on my antec 900 v.1 with 3 kaze 3000 rpm fans.I don't care for flashy lights, i want airflow. Cons: Not free.Doesn't fit HAF 922 properly. Pros: It blows.It's big.It was cheap.It's quiet-ish. 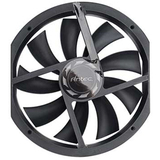 I broke my old 200MM in my Antec 900 by bumping it when it was running....yes stupid I know, anyway got this replacement and it works great, SILENT and puts out decent airflowI would put this fan in ANY case if you can find somewhere it will fit, much better than any 120mmbuy it. I got this fan with my Antec Twelve Hundred and they seem pretty good. On low, they are silent and still pushes a good amount of air. On medium, they become a bit audible but airflow increases substantially. On high, they become too noisy. In all they push a substantial amount of air compared to traditional 120mm fans. I would definitely recommend, especially because they come with a 3-speed fan controller.